Seeing as this marks my very first article, we will all mark the date on our calendars and celebrate it as a national holiday every year from now on. And EVERYONE will celebrate. I don’t care what “religion” you’re a part of, this is the new holiday of holidays. Presents and no school/work for all! I shall call it “Uber-Friday”. Ironically, today is Saturday. As some of you may notice, it looks a lot like the old X-Entertainment did. Well, mostly because I copied and pasted the HTML and then just changed a whole bunch of stuff around. Call it plagiarism if you wish, but I have to figure it out somehow. Copying someone else’s work just happened to be the quickest way for me to do it. Actually, this whole intro is pretty much a sneaky way to keep the surprise topic a surprise. I don’t want you guys to know what you’re reading about before you’re done reading the intro. If you did, you would just skip the intro and go straight for the good stuff, like a kid would run right past the vegetable stand in front of the candy factory. But like those vegetables, the intro contains many essential vitamins that you must take, even though the article itself is the much more delicious part. So now that I’ve put in my necessary metaphor, let’s get on to the topic! Yes, that’s right pizanos! It’s everyone’s favorite Nintendo-based cartoon show! I’m certain that everyone I know remembers and loves the show dearly. Sadly, a limited number of episodes are available to download and the show itself has been off the air for several years. But that won’t stop us from having super-sized fun! So grab a Super Mushroom or two and get ready for some nostalgic reading. Boy did they get stiffed. There was only about 12 minutes of animated footage on the Super Show. The rest was live action Mario and Luigi bumbling around what I’m presuming was their home/office. 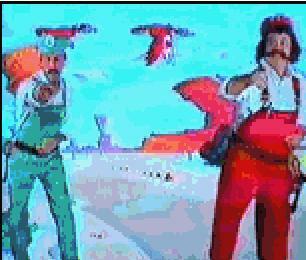 Mario was played by the famous wrestler Captain Lou Albano. Luigi was played by some guy that nobody knows. Yes, that’s right, Danny Wells donned the green overalls for the first ten minutes of the Super Show. They also got to voice the animated versions of their characters. Who would have guessed? I would have thought the execs at DIC would have hired some other guys. Oh well, win some, lose some.The one “upside”, if you will, of the live action segments was that there was always a guest star who happened to be rather popular during that era. None spring to mind, but I’m sure they used to be household names. The bros also had some kind of weird Ninja Turtles-esque pizza fetish. Their phone was covered in pizza, and there were pieces of the stuff strewn all about the place, along with the probably empty boxes. This just goes to show that not all Italians who live in Brooklyn fly the straight and narrow. No, these guys were rebels. They made their place messy, and they liked it that way. Danny Tanner would have several heart attacks. Actually, I think Bob Saget might have been a guest star once. Damned if I can remember. Well, to say the least, the cartoon was excellent. It came out after Super Mario Bros. 2 for the NES, and it featured all the bosses that everyone loved, including German-tongued Mouser, three-headed snake Triclyde, and of course the infamous King Koopa (who has more recently been named Bowser.) It seemed really authentic, if you only consider the characters. All the good guys and bad guys from SMB2 were there, but the plots and scenery were unlike anything ever seen in the video game. Not to say that any of the plots were better than SMB2’s. They were all pretty bad.The last episode I can remember seeing was entitled “Mario Meets Koop-Zilla” in which Mario and the gang (Luigi, Toad, and Princess Toadstool(Peach)) traveled to some far away town to get the Super Sushi, which would make Mario giant, and hopefully enable him to squish King Koopa out of existence once and for all. Unfortunately, Koopa got there first, and stole the Super Sushi, thereby making him “Koop-zilla” and enabling him to stomp the city to rubble. Luckily, some scientist whips up another batch of this Super Sushi and Mario gains a beer belly, pot belly, jelly belly, love handles, and lots of fat. Really, most of the growth was in the stomach area. It was gross and hilarious at the same time. Like farting. Although that is more of a perspective thing. 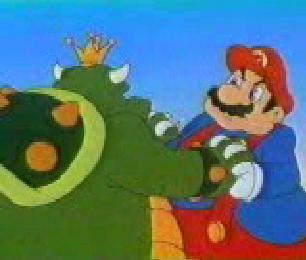 So eventually the good guys triumph, and all is well again as once again normal sized King Koopa escapes into the night. Back at the scientist’s lab, the gang celebrates the victory and Mario gobbles up a plate of Shrinking (Something), and becomes Mini-Mario. hilarity ensues. The end.See, nothing special story wise, but the one-liners were always great. Of course, nobody who was actually watching the show back then had the mental capacity to absorb any of this. They just liked the bright colors and the recognizable characters. Nowadays we can see how uninspired the plots were. It’s not like today’s cartoon plots are any better though. The last thing I should mention about the Super Show is the extra special Friday episodes. This was the day everyone waited for. This was the day that made the week worth living through. This was the day where The Legend of Zelda would air instead of Super Mario Bros.
It’s really a shame that Zelda only got 13 episodes before it was cancelled. Everyone I know prefers it over Mario’s offering. Maybe that’s because they don’t remember it very well. The Link of today and Link on the show are two very different people. Today’s Link is a serious adventurer and Hero of Time, with blond hair. The Link on the show was a joker who just wanted a piece of Zelda’s sweet, sweet can. Plus he had brown hair. Needless to say, I prefer old Link. I’m just not a fan of blond hair. This show wouldn’t have been a comedy if it weren’t for good old Link. He truly did save the day.The stories on The Legend of Zelda weren’t much better than what Mario had, and with the exception of Link’s snappy dialogue, they weren’t half as funny. Of course, there was a lot more action and magic in Zelda. And as everyone knows, action + magic = cool. So do we have a winning formula on our hands? Apparently not. 13 episodes more or less means failure. But, there is that slim chance that failures can be good though. Just look at Undergrads, Mission Hill, and Clone High. All dropped after a single season, yet they’re all great shows. All I have to say is that Zelda could have gone somewhere. I don’t see why it didn’t. It had the potential, it had the franchise, it had the theme song. But it seems the general public has failed us again and just didn’t want to give it the ratings necessary to keep it going. Oh well. All in all, The Super Mario Bros Super Show was a pretty decent show. Some may argue that the live action was good, but I would rather have more cartoony fun. A few of you may criticize me for saying a couple bad words about the Legend of Zelda, and all I have to say to you is “Excuuuuuuuuse me, princess.” They weren’t the best cartoons on TV, but they were damn good while they lasted. So if you can, build some kind of show developing company some day and revive these shows. It will benefit all of mankind and make many, many fans very happy people. Hey, I’m even going to give you a little bonus for visiting my site and reading this. Download away!